Bacon Scouts partners exclusively with award winning, championship, family-owned meats markets and delivers their products across the United States. With unique functionality, the site needed some powerful custom solutions. Bacon Scouts is a fine purveyor of delicious bacon-y goods. They needed a lot of custom work on their site to accomplish the functionality needed. 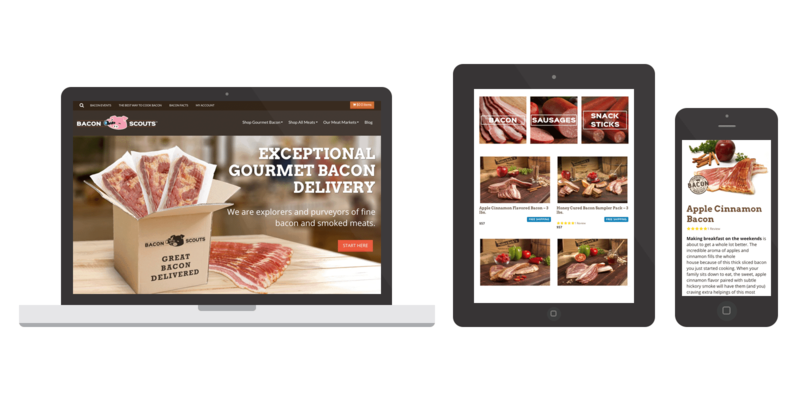 With disparate Bacon Vendors spread across the country, the site needed to allow those vendors to update their products, review orders, print packing slips, and receive payment from the users on the website, all through an automated system to make the site easy to manage for site admins. Spark Logix Studios selected several plugins that accomplished roughly 80% of the functionality that the client outlined during the Discovery Phase of this project build. After installing and testing the plugins (and adding some fixes to the code), Spark Logix Studios created several custom pieces to complete the site functionality. This included a shipping box system that automatically calculates the volume the products takes within a given package, and let’s the vendor know upon shipping how many additional gel packs are needed to fill up the rest of the space in the box. It also included a custom Stripe payment solution, which allowed the Bacon Scouts site to disperse payments after taking their commission, directly to the Vendor’s bank account. With the ability to build any custom solution, Spark Logix Studios can meet your development needs!